ELV note: We recently engaged in an e-mail chat with one of our loyal readers and thought you, another loyal reader, might be interested in the discussion. We have many thoughts about Carbone. Yes, WE have been there once, last week. On whether I love Italian food? My wife and I LOVE Italian food, but didn’t a lot of critics pan the place when it opened in New York City a couple of years ago? Fifty bucks for veal Parm? That’s insane! If you think fifty is nuts, wait til I tell you….er….uh….wait until WE tell you the one here costs $64. * And the (seriously good, almost-perfect) pork chop with peppers (our main course a few nights back), will set you back $39 in Sin City, and only $27 in the Big Apple. …is only $18, so there’s that. Wow, I guess you’re not kidding when you say Las Vegas Strip restaurants really hose their captive market, and all those gullible tourists. Let’s just say that the dark days of the 2008-2014 recession are as over as Lamar Odom’s NBA career, and it’s open season on conventioneers’ wallets these days. So Carbone will set me and the wife back…? $200 with no booze whatsoever; $300+ if you slug back some cocktails and/or a bottle of wine. Speaking of that list, how did you find it? With the help of the sommelier. Sharp as a bowling ball, you are. So…prices notwithstanding, how did you like the list? It’s a very good Italian wine list, one of the best in the city. Stick with a couple of glasses if you’re on a budget, but get ready for some sticker shock there also, as almost every glass is up around $20/per. On the plus side, the somms are super nice and very good looking. So, let me see if I have this right: Carbone is an upscale, very expensive, theatrical, Italian-American joint that is single-handedly trying to resuscitate this genre with excellent cooking of immigrant Eye-talian food in large portions at jaw-dropping prices? Both are deliciously decadent, but enough for 4-6 to share. Easily. What about the Caesar salad and the meatballs? I saw on your Twitter feed that you loved them. …that are officially off-the-menu, but always available. And avail yourselves of them, you should. We’d describe the Caesar to you, but we’re out of hyphens. So, there you have it: a complete, hyphen-accentuated synopsis of our meal — an almost flawless evocation of this cuisine that, thankfully, we didn’t have to pay for, although we did leave a $100 tip. So you mean, imperious, insufferable epicureans (like my brother-in-law, who never met a soufflé he didn’t swoon over) will like it? Exsqueeze me, are we related? Seriously, what they’ll like, if they let themselves, is the feeling of the place. Carbone and Torrisi (and their designers) have perfected the art of making everyone feel as if they’re in an old-school movie while they’re eating there. The groovy, 60s sound track plays a just-the-right mix of crooners and doo-wop, and the atmosphere is a throw-back in all the best ways — from the tuxedo-ed waiters to the flaming bananas. Salute to YOU, disembodied, imaginary, fictional fan of Eating Las Vegas! * Note: an excellent version of this dish can be had at Allegro in the Wynn for $49. Hopefully another reader will ask for meticulous breakdowns of the Caesar and the meatball. That being said, my reply is this: Does food taste better to a blind man or a sighted man? I am glad you linked John Mariani review on the NYC location It was a good relection of my experience. I along with several others ate at Carbone’s several years ago.The food was good and service on the ball. Having said that the meal cost was indeed outrageous .Was it something I would go back, no. Not because it was bad, but it was not anything that was transformative or really worth the cost of admittance. Its interesting that the Las Vegas Carbone is pushing the price point even higher than NYC. In view of the fact 40 million touristas flow thru our humble burg each year there will be enough posers, expense account schmucks willing to pay obscene amounts of money to eat and be seen. No local family or real Italian foodie will set foot in this joint to drop the monthly mortgage. 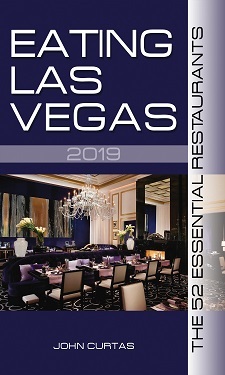 There are a half a dozen good Italian restaurants on and off the strip if you want to get the “real deal” Just reference ELV’s reviews and recommendations. It makes Il Mulino look almost reasonable in cost. There are a few of us who also write honestly of the Vegas food scene, so there is that. I went with 6 others, including a world-renowned local Pizza maker and a few widely traveled gourmands last night. We were not comped like John, but still made it out at $100 with almost a dozen plates shared and no booze at all. His comments about going as a group are very correct. On the other hand, our service was rather poor – captain disappeared for long periods of time and we sat holding the enormous menu for nearly 45 minutes. Every pasta was overcooked, the noodles all limp and the $75 (yes, $75) Lasagna was burned. The Caesar is okay, but at $42 for enough to share by 7 it is not worth it. The meatballs, at $6 each, are fine…but Portofino, Rao’s, Allegro, and others make them better. 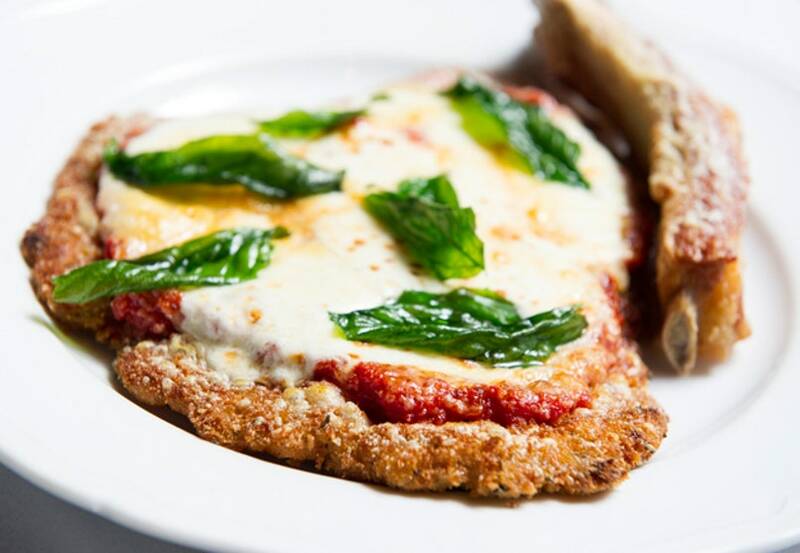 Veal Parm is legit, and probably worth the price. The Chicken Scarp is also excellent. Foie Gras Venezian is a great dish despite the $45 price tag and both the Pizza Focaccia and Garlic Bread are excellent.